29 wins for APHA Grand Champions and 30 for Reserve Champion. Breed your mare with confidence! while being bred. The owner pays particular attention to every need of each mare. Put the BULK back into your paint horse! with a gentle, mild, yet very willing disposition. 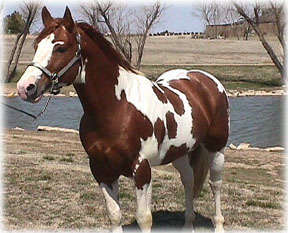 His Grandsire, Painted Robin's APHA # is 800. He is a "foundation", performance Paint horse. makingYOUR next winning performance horse! "Bred Right and Fed Right"
feeding program equals a sound, good looking athlete! Painted Gus presently has 14 foals on the ground. solid foal was produced out of a crop out mare. So far, that is an 92% color producer! $400. LCFG ($100. Booking Fee) We offer a live foal and a color guarantee: If you get a solid filly: we'll breed your mare the following year at 1/2 off the breeding fee. If you have a solid stud colt: we'll breed your mare the following year for FREE! You'll still be responsible for shipping cost and/or mare care. 15 minutes from the Wichita area.